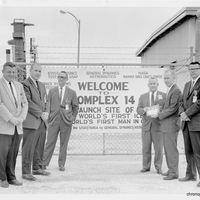 Dr. Cal Fowler (1929-2013), Cape Canaveral Air Force Station (CCAFS)'s Launch Complex 14 (LC-14) Manager, accepting the Sapley Award for the "Best (Safest Complex during 1962)" on January 23, 1963. 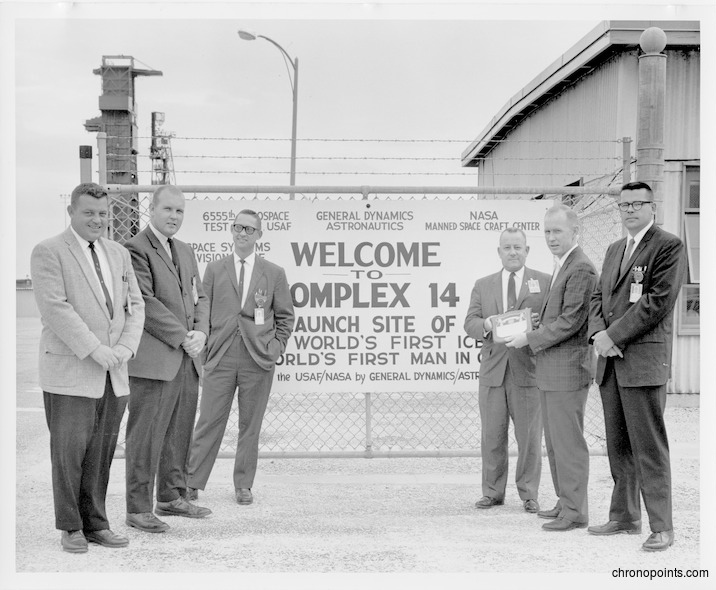 Photographed with him, from the left to right, are Ned Mullins, Complex Foreman; an unidentified Sapley representative; Jim Stackey, Complex engineers; George Page, Missile engineers; Dr. Fowler; and B. G. MacNabb, Operations Manager. Original black and white photographic print, January 23, 1963: Private Collection of Dr. Calvin D. Fowler. Digital reproduction of original black and white photographic print, January 23, 1963. “Dr. Cal Fowler Receiving the Sapley Award.” RICHES of Central Florida accessed April 18, 2019, https://richesmi.cah.ucf.edu/omeka/items/show/6396.